Silver Gate Cabins have earned a reputation for clean and comfortable rooms at a reasonable rate. The cabins are a great place for families, as we have a swing set, volleyball, sandbox, barbeque grills, picnic tables and fire pits. The cabins have the convenience of home including a complete kitchen with pots, pans, and dishes. All you need to bring is food and clothes! Groups, families, or singles, we have the accommodations that will please all! Motel start at $72/night and cabins start at $115/night. Discounts offered for stays of 10 nights or longer. At Pine Edge Cabins having coffee on your front porch and watching mountain goats on the sheer rock mountain face behind the cabin is an average morning. Pine Edge Cabins features seven cabins ranging from $115-$190 per night. Cabins provide for all of your basic needs. Shower, hot water, some kitchenettes. Picnic tables, fire pits and tin roofs are substitutes for television, telephones and hot tubs. 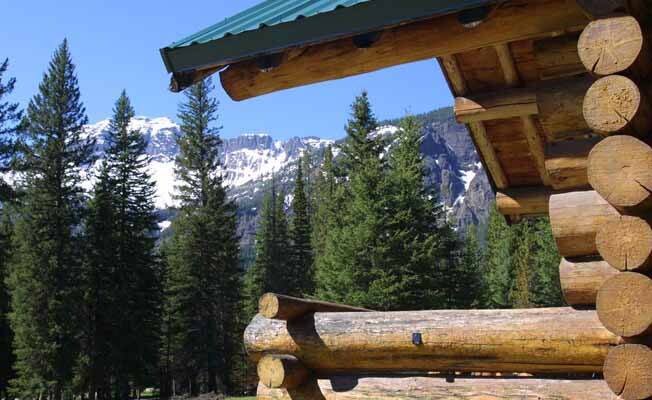 Whispering Pines Cabins are nestled in the woods on a bend in the Soda Butte creek. Just a 1 mile hike and you will find yourself inside the park boundaries at the base of Amphitheater, one of the glacier cut peaks visible from your cabin. Soda Butte Creek is a magnet for wildlife in the area and offers trout fishing and a cold morning dip for those willing to brave the frigid waters. Cabins provide for all of your basic needs; shower, hot water, some kitchenettes. Picnic tables, fire pits and tin roofs are substitutes for television, telephones and hot tubs. Rates vary from $85-$180/night. Call for availability.